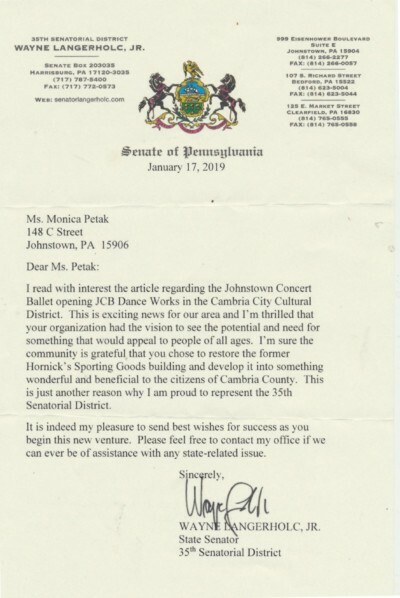 Recent letter from the State Senator. Ballet was difficult for me; I was not a natural, but it became my outlet, where I met new people, new ideas and new art forms. A lot of my personal growth and discipline are a credit to working with Carla Prucnal. Ballet relaxes me. I can empty my mind. I work hard, but nothing good comes without earning it. I will always remember how to carry myself, walk and sit. Encouraging the progress of dancers who have a serious interest in classical ballet. Fostering educational programs for students of all ages, backgrounds and abilities. 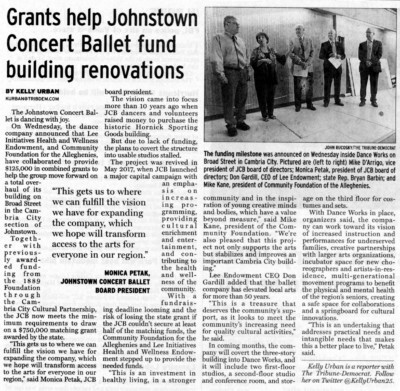 Staging classical and innovative performances for communities throughout Johnstown and neighboring areas.